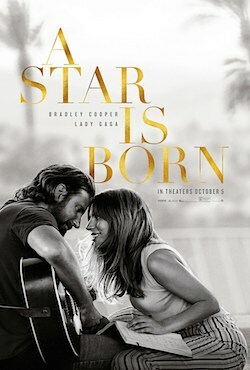 Maybe it's time to let the old ways die…"
This opening lyric and recurring motif is a bold supposition from the lips of Bradley Cooper, as he goes Full Dennis Waterman™ in starring, directing, co-writing, co-producing, writing the theme tune and singing the theme tune to 2018's A Star Is Born*1. 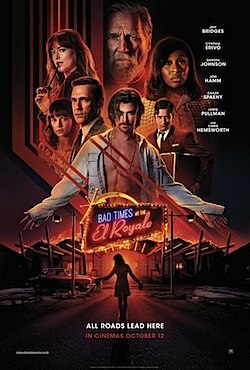 It's the fourth cinematic rendering of this tale of rags to riches via clinical depression and substance abuse, with Warner Bros hoping to bring a new spin to a story as old as showbusiness. A Star Is Born's first act is a beautifully chaotic affair, with cinematographer Matthew Libatique only breaking away from the intimate hand-held trailing of his subjects for the occasional locked-off shot, mathematically composed to linger in the memory. While it's obviously reliant upon the taste of the individual, the music scenes in the first act are absolutely outstanding, whether it's a full rendition of a song or just a snippet. 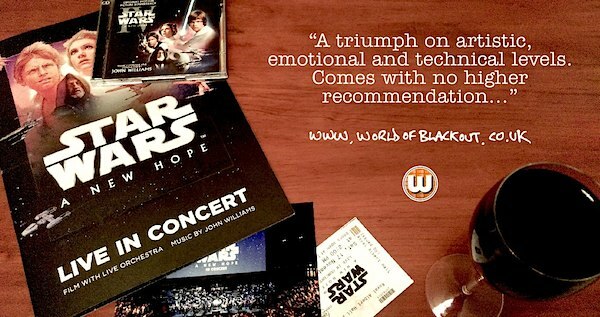 Expertly crafted pieces, meticulously performed, every one an earworm-in-waiting. The inherent strife of country music may be a cliché of course, but this is where the real emotion of the movie lies, with the angst of characters we've barely met communicated perfectly through a three-and-a-half minute burst of co-ordinated harmony. The 'goosebump' moments in the film's trailer are even more hair-raising in the final cut, so naturally when the sanitising effects of Ally's fame begin to be introduced, the bristling intensity of the piece dips accordingly. The central theme of existential numbness plays like a New Country b-side to Inside Llewyn Davis. Bradley swaps out his casual stubble for a full, unkempt beard in this role, duly adopting Hardy's Law™ of muffled pronunciation (unless he's is singing into a microphone, in which case Cooper's voice carries studio-levels of clarity). Sam Elliott also arrives as Jackson's older brother and manager Bobby, bearing only a voluminous moustache but illustrating that we perhaps shouldn't mock this verbal affliction as it's clearly a gene carried through the family. Joking aside, it's clear from the outset that Cooper has committed to Jackson's side of the story above all else, both as a performer and director. We open with our male lead taking to the stage in his trademark shambolic style, the magic snapping in once his fingers touch wound-steel and his mouth comes within range of a microphone grille. And we see this ritual time and time again, in close range. Cooper doesn't want the cinema audience to feel like they're the concert audience, he wants them there on the stage. Although we see crowds (filmed during 2017's Coachella festival) during A Star Is Born, not a single shot of the stage is taken from ground-level. Yet at the same time, viewers never feel like they're part of the band either, just onlookers who are fortunate enough to be witnessing this first-hand from a unique limbo. This disconnect reflects the age-old (and thoroughly self-indulgent) irk that an artist can never be in the audience for their own show. While the noise, confusion, harmony and adrenaline of playing on-stage are addictive in their own right, they're a world away from the unique buzz which is felt in a crowd of thousands, collectively hanging on every note blasting toward them. Speaking of stagecraft, musicians in the audience may well raise an eyebrow at the number of times Cooper pulls theatrically away from his microphone, while the vocal line they're hearing continues at the same volume and intensity. More tellingly, this doesn't occur when Gaga is in the spotlight, an artist who has a different ratio of stage-to-screentime experience in her CV. While we're splitting hairs, A Star Is Born is also a movie which hopes its audience won't know that a studio can't record a vocal track when someone's also holding their monitor headphones open a foot away from the mic. As is so often the case, much of what audiences take away from A Star Is Born will hinge on expectation. Whereas the trailer suggests a parable set in the music industry, it quickly becomes closer to the film industry's idea of what the music industry must be like. To the point where Cooper is not only homaging previous versions of the title, but also lifting well-worn beats from movies like Rock Star and Wayne's World. Another fundamental issue is Cooper's focus on the central characters at the expense of a large supporting cast. Jackson Maine is, by his very nature, vague and alcoholically enigmatic. While we learn what we need to know about the superstar through Ally, we glean remarkably little about her motivations in turn (a 'stage-dad', that's about it). Peripheral players are barely introduced, and even secondary characters' names often aren't used until their second or third appearances (and if anyone knows why Ally's father and his friends constantly hang around in the house at all hours of the day and night watching horse-racing but are wearing shirts and ties, please let me know below). We can see why Jackson falls in love with Ally, but we're never quite convinced of what she sees in him. Despite her career trajectory, it's clear Ally is not intentionally using his status as a stepping stone, yet we see little other than slurred compliments, professionally tousled hair and a great smile as to what she's really fallen for (not that this can't be enough, I suppose - maybe that's the lesson?). As the stage routines become more choreographed, so Cooper's directional resolve falters. We spend less time with Jackson and more with Ally, but the foundations of her character aren't strong enough to hold the dramatic weight loaded upon them. Luckily, Gaga's capability as a performer mostly overcomes this, but the actress's personality has to over-compensate as her character is shredded away. 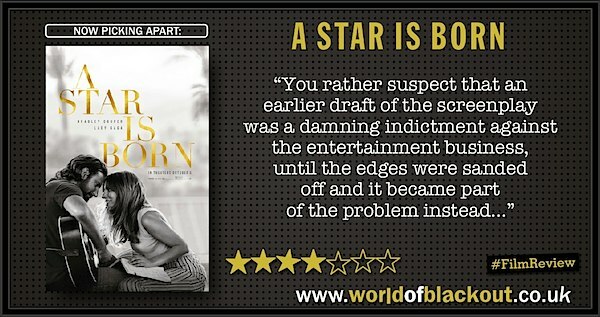 A Star Is Born begins to run out of things to say just after the hour-mark, and Cooper struggles to develop characters the story has already destroyed. The feeling certainly prevails that Warner Bros are thinking about prospective soundtrack sales in the same way that Disney have an eye on lunchboxes and action figures. And that's fine in itself (it's a business, after all), but stings a little in a tale which claims to study the justness of artistic integrity. One rather suspects that an earlier draft of the screenplay was a damning indictment against the entertainment business, until the edges were sanded off and it became part of the problem instead. There are moments of real greatness here, but these are largely confined to the first act. A shift which the audience is almost cruelly reminded of when the film crescendos into a power-ballad interspersed with a flashback montage (in case anyone in the auditorium can't work out what that scene means). An all-too-accurate depiction of how something raw and beautiful can be moulded into the insipid and formulaic, in this respect the film leads by example. As a cautionary tale, A Star Is Born is fine if somewhat unremarkable. And while the central duo are irresistibly solid, it would be surprising if this product ages as the classic everyone at the studio is hoping for. While it would be unfair to conclude that the old ways should be allowed to die, it would certainly be an idea to take a closer look at how they're repackaged and what they're bringing to the party. Structurally, the three previous versions of A Star Is Born. The first 45 minutes are. Level 1: Snap Wexley's in this. In short: I went to see Venom. It is not a good film*1. If there was ever a celluloid embodiment of the words 'oh mate', this would be the one. So. It's Los Angeles. Some gooey aliens want to take over the Earth because scientists went into space and that was always going to end badly. We're at the point now where extra-terrestrial invasion narratives are no longer a metaphor for colonial attitudes or fear of progress, but just reflect the page where the library-copy of The Hollywood Screenwriter's Handbook falls open. Tom Hardy plays Eddie Brock, an investigative reporter who makes non-branded videos of domestic issues which we first assume are just for YouTube, but are apparently for some corporation or other, the precise nature of which isn't explained. He's the kind of hard-hitting, new-media journalist who corners his quarry by politely arranging meetings in their place of work then arriving on time. Who ruthlessly fronts his videos by looking at neither the camera nor his interview subject, but at a scratty notepad clutched in his hand while he mumbles vague accusations. Who responds to firm corporate rebuttal by leaving the building when asked. Who is so celebrated and in-demand as a journalist that when he's sacked from his part-time job nobody even notices, let alone head-hunts him for their own company. If Brock is actually capable of any kind of sleuthing or intelligence-gathering, we don't see it in this film. Anyway, Eddie is poking his nose into things he shouldn't, and an alien goes in him. That's Act 1. Brock's girlfriend, Anne Weying, is played by the Academy Award-nominated actress Michelle Williams, who brilliantly and incisively interprets her role as a woman looking indelibly bored for two hours. Anne is a lawyer whom we never see doing any lawyering, although given that a) it's not her film, and b) we barely see our investigative reporter actually investigating or reporting either, this is hardly surprising. Riz Ahmed plays Carlton Drake, who is The Baddie. We know this because he wears a sharp suit and whenever he opens his mouth, is forced to recite lines from The Movie Baddie's Phrasebook while squinting at underlings just off-camera. Woody Harrelson is in this but not until the end, and then you'll wish he hadn't bothered. So. Venom feels like spending two hours watching first-takes of actors reading their lines for the first time, from a script which was written by a 12yr old who only watches superhero movies. Demographically, Sony have spent so much effort angling their product to a non-kiddie audience that they didn't notice anyone old enough to get in will have seen all of this before (and better), whether it be any movie with aliens arriving on Earth, Todd McFarlane's other creation, Spawn, or even just the distrusted-authority in shiny skyscraper laboratories of Sony's last two Spider-Man outings. And although we get enough of the glistening fangs and body-horror to squeak through as a 15-certificate, there's little here to actually earn this edgier rating in terms of lasting threat or human injury. By the time Brock and Venom become a variety double-act of grumpy bickering which barely stops short of looking right down the camera, this is like a Hallow'een-costume Deadpool. But without the swearing. Or the self-awareness. Or the wit. Beats are taken haphazardly from the horror genre, from the conspiracy thriller, sci-fi, action, comedy and of course the superhero-origins story. None of these gel together in the final edit, which incoherently changes tone at a rate suggesting that director Ruben Fleischer has suffered some sort of cranial trauma, and is permanently unable to recall the footage he shot each previous day. As a result, Hardy is left to bimble along from scene to scene in the title role, himself displaying symptoms of scriptual amnesia as he struggles to work out who his character is meant to be. The lack of direction in Tom's performance - both narratively and in terms of just being directed - is staggering. The most disappointing aspect is that Venom should be better. It could be better. Why isn't this better? By this point, Sony have held onto the Spider-Man rights long and hard enough to know what works, what will be derided by critics and audiences alike, and what is ultimately damaging to their own reputation. To have assembled a cast this impressive and still have churned out a Tesco Value Sausage of a superhero movie is an embarrassment to all concerned. There are some moments of fun, but there are far more which aren't. 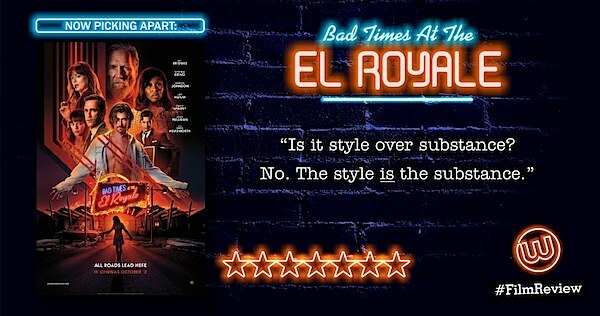 Perhaps the only saving grace is that the movie appears to exist (thus far) in its own standalone stream of continuity. In this respect, at least it will be easy to disregard. 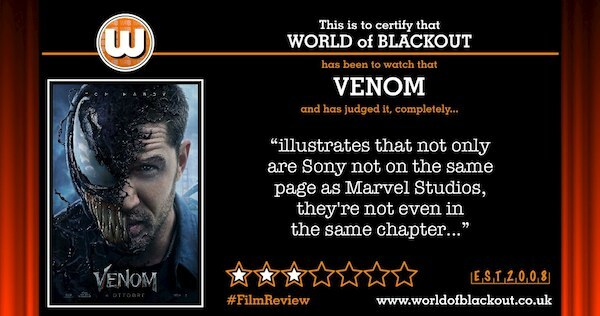 Venom shows that not only are Sony not on the same page as Marvel Studios, they're not even in the same chapter. Okay, it's not Fantastic Four levels of bad, but the tonal inconsistencies and cack-handed moralising in the final moments put this on the same shelf as Ghost Rider. There is a decent Venom movie to be made from this story, by this studio and with this cast. • Is there a Wilhelm Scream? There is. • Is there a mid-credits scene? There is. • Is there a post-credits scene? Well, kinda*2. Life, and the first Amazing Spider-Man flick. Not unless you like your migraines to originate from a 60ft wide screen. Interestingly enough, this features the same cinematographer - Matthew Libatique - as A Star Is Born, also released in cinemas on the very same opening weekend. Although his hand-held, closeup style often threatens to derail that movie, too. In Venom, Matthew teams up with editors Alan Baumgarten and Maryann Brandon to go Full Seizure-Mode™. Sure. This will make an interesting companion-piece for other superhero movies in the years to come. There is, and it's as subtly woven into the mix as one would expect from a movie where a murdering alien says "turd" in the trailer. Level 1: This has got Bodhi Rook, Tobias Beckett and let's not forget Last Jedi Deleted Scene Stormtrooper Tom himself in it. Not a bad turnout for a flick which doesn't have a Disney stamp in sight. *2 The mid-credits scene is a coda to Venom, so stay for this. After the names have rolled (and I don't usually moan about the time taken to credit everyone who contributed to making a movie, but Venom's roll-call is presented in the same 'easily readable' speed and size typeface throughout, mostly in a single-column list. Reader, this is a four-songs-and-a-bit-of-the-soundtrack-length reel), we get a sequence from the upcoming Spider-Man: Into The Spider-Verse animated film. 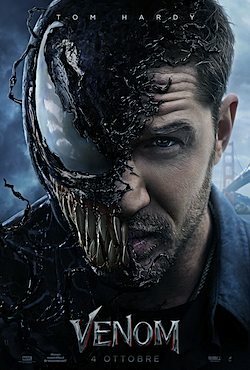 It's not connected to Venom by anything other than the rights-holders, and if you arrived at the cinema early enough you'll have already seen the latest trailer for it. With this in mind, you'll already know whether this is worth you hanging around for an extra ten minutes.